When loads, weights, pallet sizes or product dimension vary greatly, a Powered PalletPal with total operator control is the solution. A heavy duty airbag positions loads up to 4,000 pounds with as little as 80 psi. A foot valve allows the operator to adjust the load to any position up to 33.5" (plus pallet height), so it's always at the most comfortable working height. 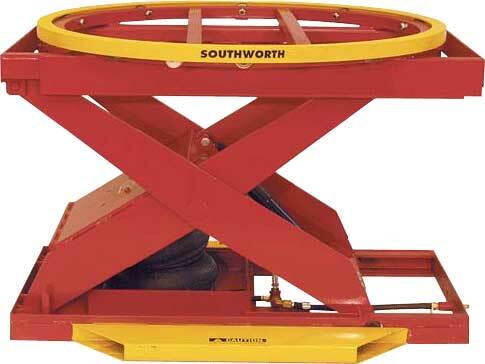 The manual turntable top allows easy rotation of the load so that the operator is always working on the near side.